It may be a little too late for your Super Bowl party, but this is still a pretty good deal. 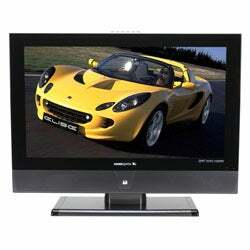 Hannspree, a quality LCD manufacturer, has this 32-inch LCD HDTV for $500 after all is said and done. It has a list price of $1,000, but it also includes a $350 instant savings and $150 mail-in-rebate making it $500 in the end. This HDTV includes a 1366x768 resolution, 1000:1 contrast ratio, 8ms refresh, integrated HD tuner and HDMI.